All Their Ducks Are In A Row – The Anaheim Ducks can do no wrong. Todd Bertuzzi's weak backhand shot with less than 30 seconds to play in regulation broke a 1-1 tie Wednesday night, as the defending champs improved to 15-3-1 in their last 19 games with a 2-1 win over the Dallas Stars at the American Airlines Center. 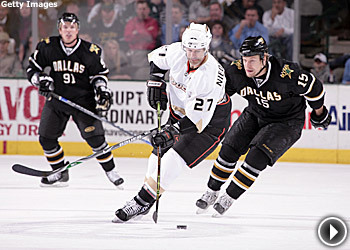 With the victory, the Ducks moved three points ahead of the Stars for second place in the Pacific Division. It didn't get there quickly, but it managed to find its way past Dallas goalie Marty Turco. The Stars have lost three in a row and six of their last seven games. It was just the turnaround the Ducks were hoping for, as Dallas entered Wednesday's action with a 5-1 record against Anaheim this season. It's possible these teams could meet in the opening round of the Stanley Cup Playoffs; if the season ended today, they would. Six Straight – One of these days, the New Jersey Devils are going to beat the New York Rangers again. But they're going to have to wait until next Thursday to get another chance. New York made it six in a row against its cross-river rival Wednesday night, as Chris Drury ruined Martin Brodeur's bid for a shutout with 4:46 to play in regulation, and then Nigel Dawes scored the lone goal in the shootout in a dramatic 2-1 decision at the Prudential Center. With the victory, the Rangers improved to 6-0 this season against the Devils. They haven't done that since – drum roll, please – the 1993-94 campaign. Once again, it was Drury getting the timely goal. His knack for coming up with big scores is one of many reasons the Rangers opened their wallets last July 1 to sign the Connecticut native. Havin' A Party – San Jose Sharks center Jeremy Roenick isn't ready to decide whether or not he'll play in 2008-09. Right now, the 38-year-old Roenick is focused on helping his team win a Stanley Cup. It truly would be the culmination of a season Roenick has enjoyed thoroughly. He had a goal and an assist in regulation Wednesday, and then added the winning goal in a 4-3 shootout win against the Minnesota Wild at HP Pavilion. "I'm having a blast," said Roenick, who has 12 goals and 14 assists this season. "I don't remember having this much fun playing hockey. We have a great team, and we have a really great chance for a Stanley Cup this year. I'd like to keep my options open. I feel really good and I'm skating really good and obviously putting the puck in the net." Roenick is putting the puck in the net at the right times, too; his eight game-winning goals lead the Sharks and are tied for third in the League. Deja Pew – Martin St. Louis summed it up best after he and the Tampa Bay Lightning allowed six third-period goals in a 7-4 loss to the Buffalo Sabres on Wednesday night – one that featured yet another hat trick from Thomas Vanek. The Sabres rallied from a two-goal deficit to beat Tampa Bay 4-3 in overtime Feb. 20, when Vanek also scored three times. "You can write the same story as the last time we were here: Third-period collapse," St. Louis said. "It's a bad feeling." It must have been, considering the Lightning held a 4-1 lead after two periods Wednesday and outshot the Sabres 8-2 in the second. But Buffalo manhandled Tampa Bay in the third, outshooting the Lightning 16-4 in the final 20 minutes. Zetterberg 3, Blue Jackets 1 – It only was a matter of time before Henrik Zetterberg snapped out of it. The Detroit Red Wings' superstar put an end to a seven-game goal drought Wednesday night in convincing fashion, as he recorded a natural hat trick in the third period in a 3-1 win against the Columbus Blue Jackets. "It doesn't happen that often, but I think we saved a lot for the third," Zetterberg said. "We didn't have that much offense in the first two … it was tough. We had a lot of penalties and it was tough to get any momentum going for us." Once Zetterberg got things going for the Red Wings, the club's two-game skid was over. It was Zetterberg's first hat trick since Dec. 7. "Hank came up real big for us," Detroit captain Nicklas Lidstrom said. "A great individual effort on that first goal to get us back in the game and finally the power play had a goal, too. We had some chances, but he finally capitalized on one." Almost There – The Carolina Hurricanes are thisclose to regaining their throne atop the Southeast Division. Eric Staal celebrates his 35th goal of the season in the 'Canes' 5-3 win against Atlanta, Carolina's 10th victory in 12 games. Sergei Samsonov had a goal and an assist, and All-Star Game MVP Eric Staal scored his 35th goal of the season as Carolina picked up a 5-3 victory over the reeling Atlanta Thrashers at Philips Arena. The win was the 10th in 12 games for the Hurricanes. Hurricanes coach Peter Laviolette, however, was less than pleased with his team's performance against a team so close to earning a lottery pick in June's NHL Entry Draft. Laviolette is expecting more from his club when it returns to the ice Thursday against the Florida Panthers at BankAtlantic Center. Meanwhile, the Thrashers have lost 15 of their last 17 games. 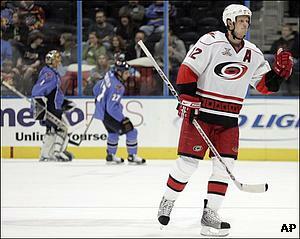 Team captain Bobby Holik was furious afterward, believing his team should have done more for goalie Johan Hedberg. Making Tony Proud – After honoring Hall-of-Fame goalie Tony Esposito in a pre-game ceremony, the Chicago Blackhawks made sure their fans were just as happy after the game as they were prior to the opening faceoff. In his first start since Feb. 20, Nikolai Khabibulin stopped all 25 shots he faced, as the Blackhawks kept their slim playoff hopes alive with an impressive 5-0 win over a Washington Capitals team fighting for a postseason invitation. While Khabibulin was sharp – his stop late in the third period on Alexander Semin was downright ridiculous – the entire Blackhawks defense came up with a huge effort. It held superstar Alex Ovechkin to just two shots on goal. Esposito, who played 873 games for the Blackhawks from 1969 to 1984, posted a team-record 418 wins. With Patrick Kane and Jonathan Toews leading the way, Esposito sees only good things in Chicago's future. "It's an honor to be here with the new, young, vibrant Hawks," Esposito said. "I know they're going to get better and we're all going to fill this building." Contact Brian Compton at bcompton@nhl.com.